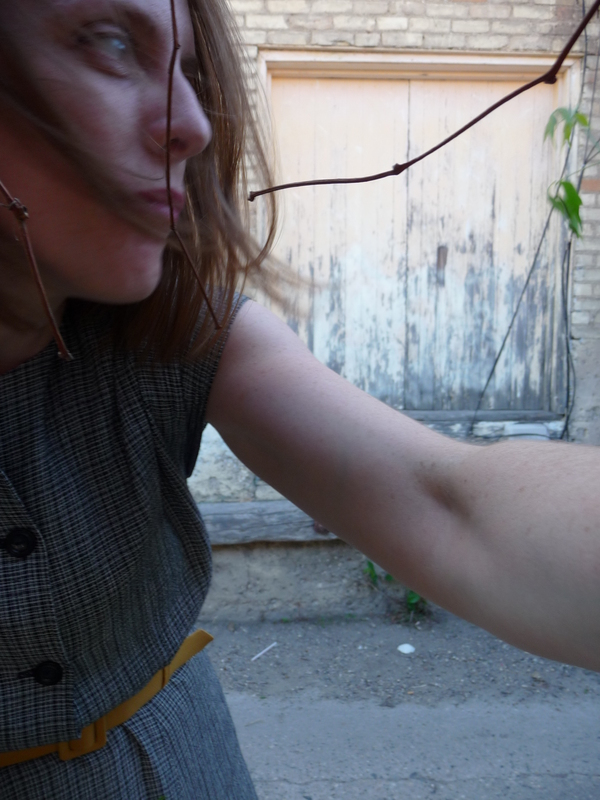 We are well into the only Me-Made/Self-Stitched event of 2012, and the first such event since I’ve had a blog! So, while most of the pieces I’m wearing are repeats to as far as MMM/SSS is concerned, I’ve never posted about them here. 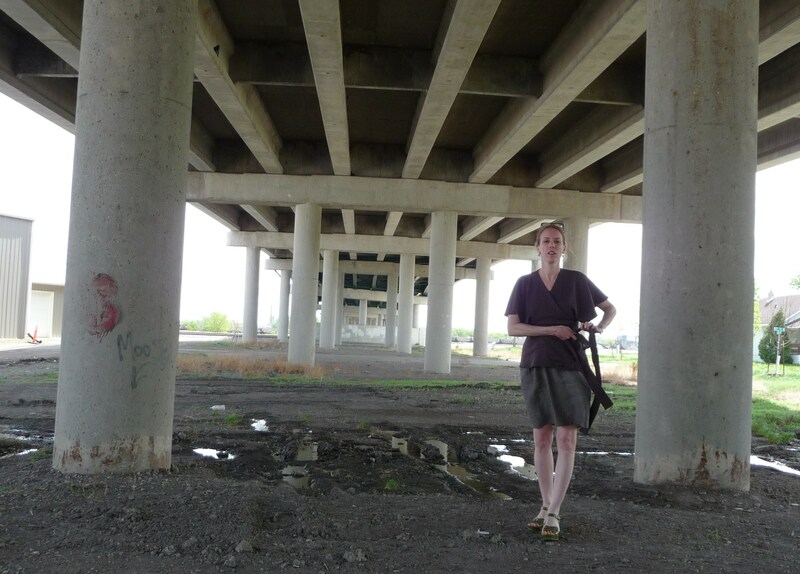 I’ve also been trying to keep things more lively this time around by finding more interesting locations to take outfit pictures. While there are lots of familiar faces that I’m so glad to see “in the arena” so to speak, there are others whose presence is missed! Colette Parfait; in black pindot wool with vintage buttons (straps widened slightly to accomodate the buttons). 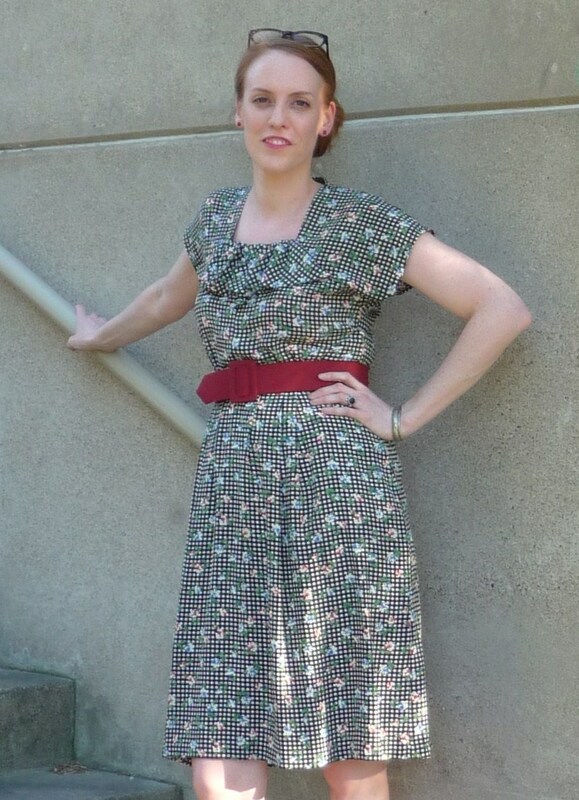 This was one of the first dresses I made after I returned to sewing a few years ago. The wool is so incredibly soft you just want to make pajamas out of it. In hand is McCalls M6084 cardigan in evergreen wool gauze; left the cool golden selvage as the finished edge all along the collar/neckline edge. 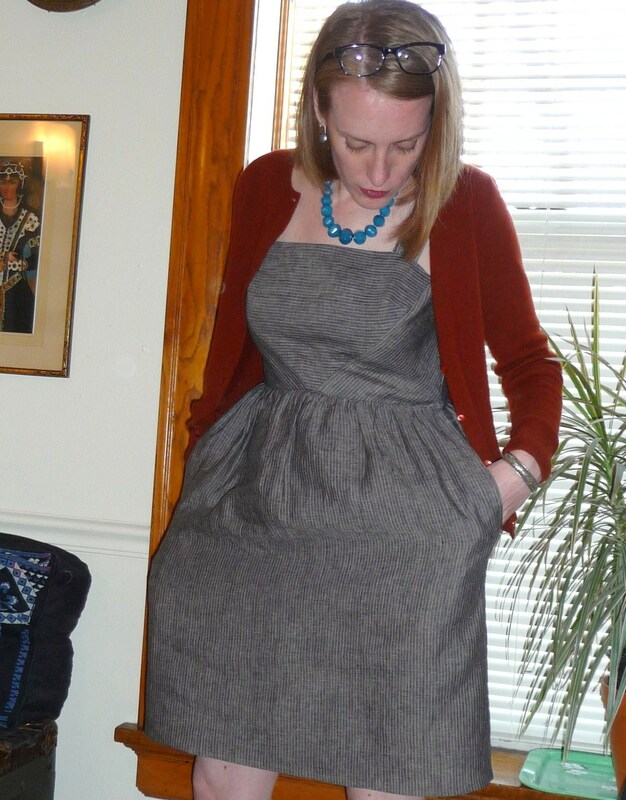 Pattern Runway Easy Kimono Dress in a stretch cotton shirting with me-made belt made from recycled/vintage Japanese wool, and ubiquitous wool tweed wrap pictured better here. The dress fabric is a black and white pinpoint, so has a tweedy surface texture which I love. 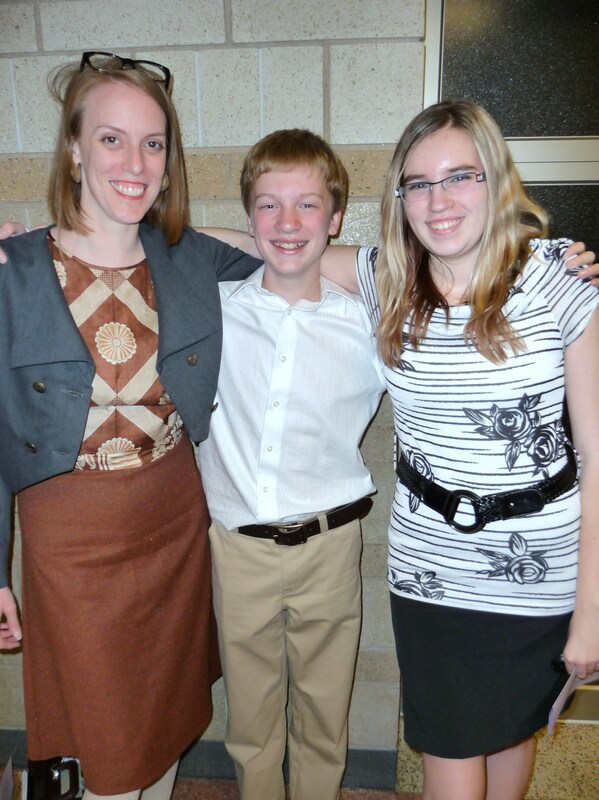 At Nephew’s band concert, also pictured with beautiful Niece! 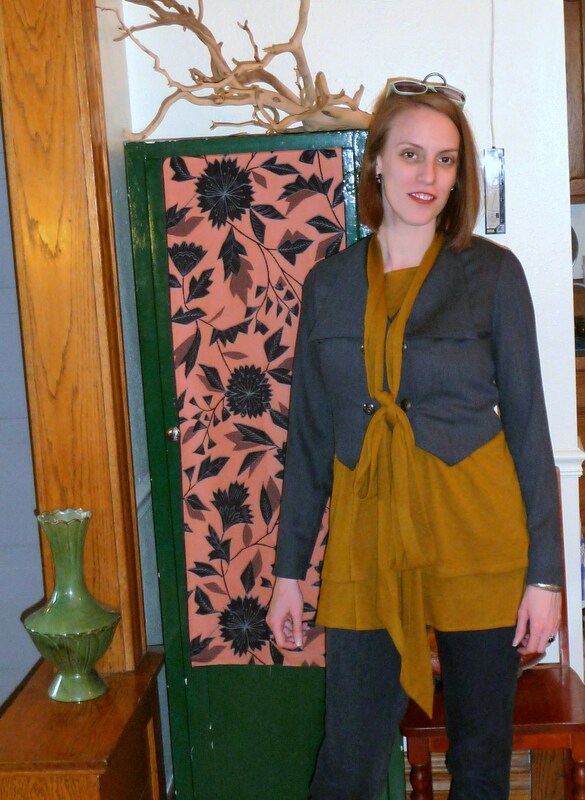 Top is 70s Butterick 6835 refashioned from an old sari (tied in back rather than in front this time), jacket 30s Butterick 5195 and skirt is a Colette Ginger. Left: Colette Sorbetto with neckline and pleat stitching, with black McCalls jeggings. 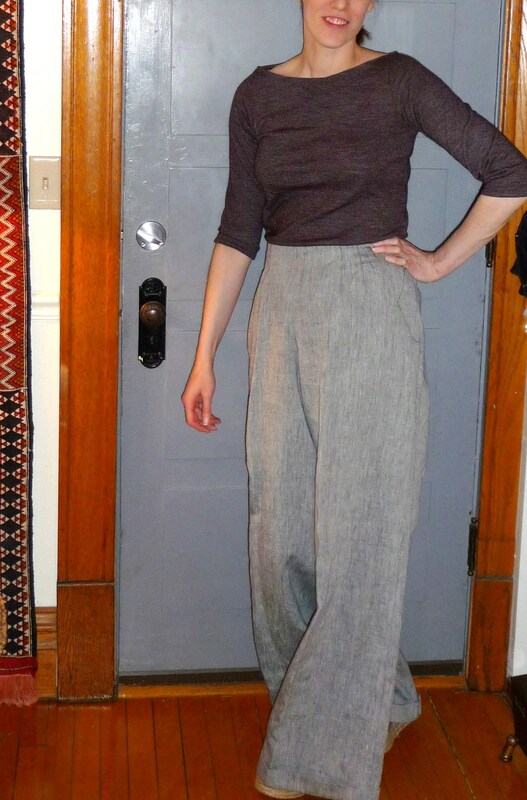 Right: Boatneck T from Built By Wendy Sew U Knits book, in aubergine wool jersey, and linen Evadress 1933 wide-leg pants (with nifty pocket detail! ), partially blogged here. The pants definitely need a good press to look their best. 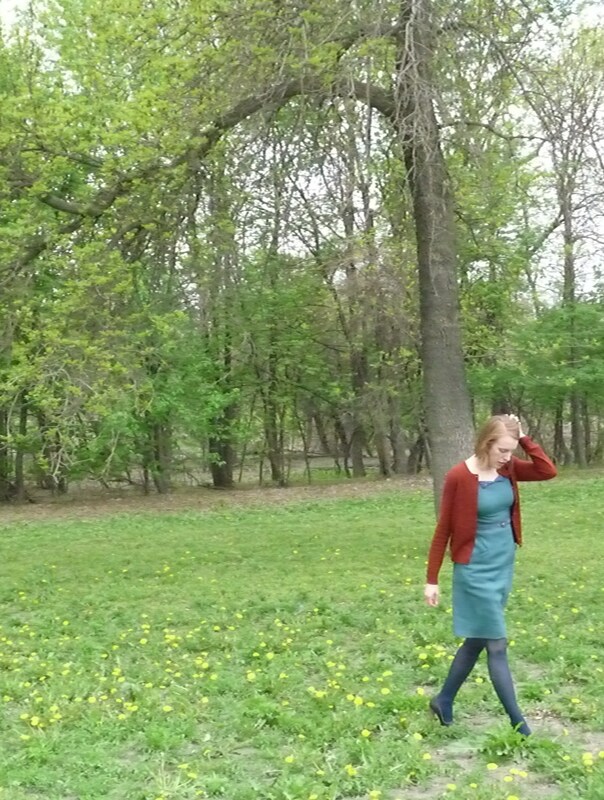 My wool Colette Rooibos with matching belt, a purchased cardigan, several thousand dandelions, and me in the park on a grey May day. From way before I had a blog, but there a dozen or so pictures of this dress + commentary in my Flickr photostream, for example detail here. 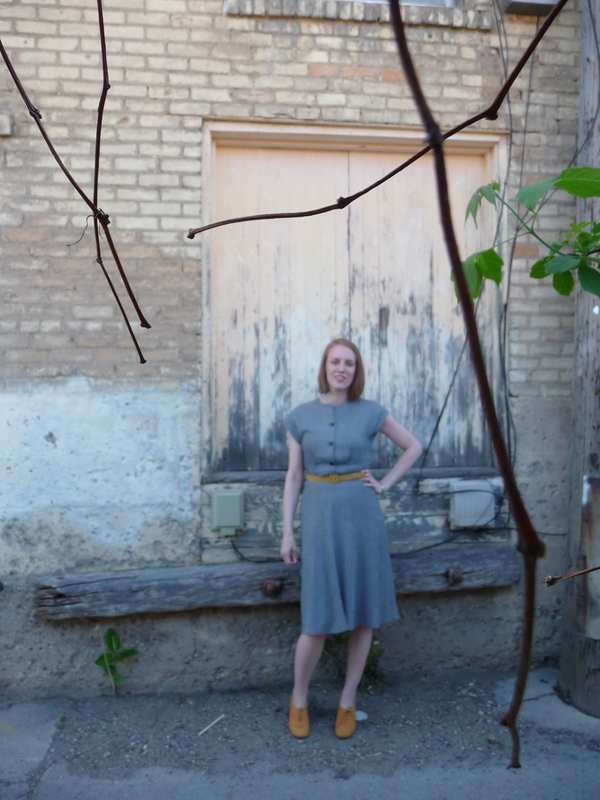 Dress is: vintage 1961 McCalls 5953 (looks more like pattern art when crinolized), also me-made belt, although the cardi is purchased. 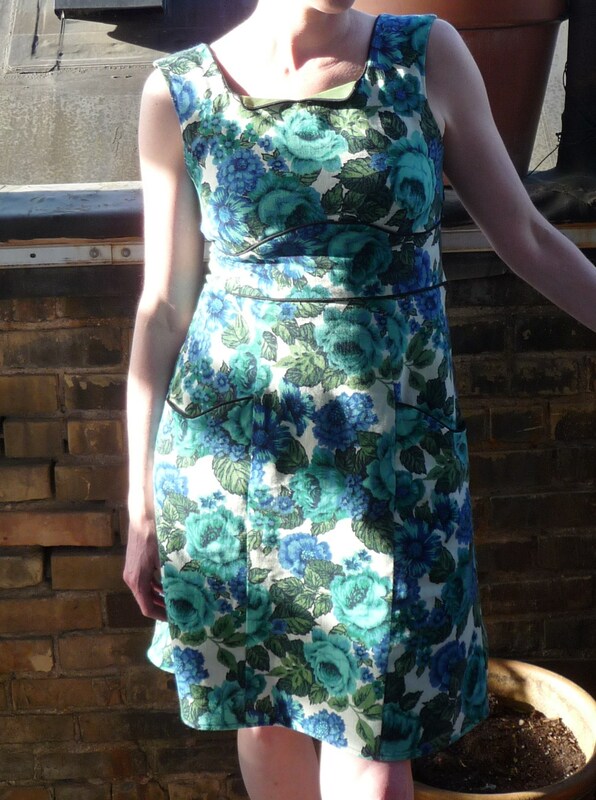 Dress from before blog, but better pix & deets in photostream here and here in sun with colors in full glow. Unfortunate autofocus issue not apparent until too late to get another, but the shape of the dress and outfit was apparent enough to use for daily outfit photo. 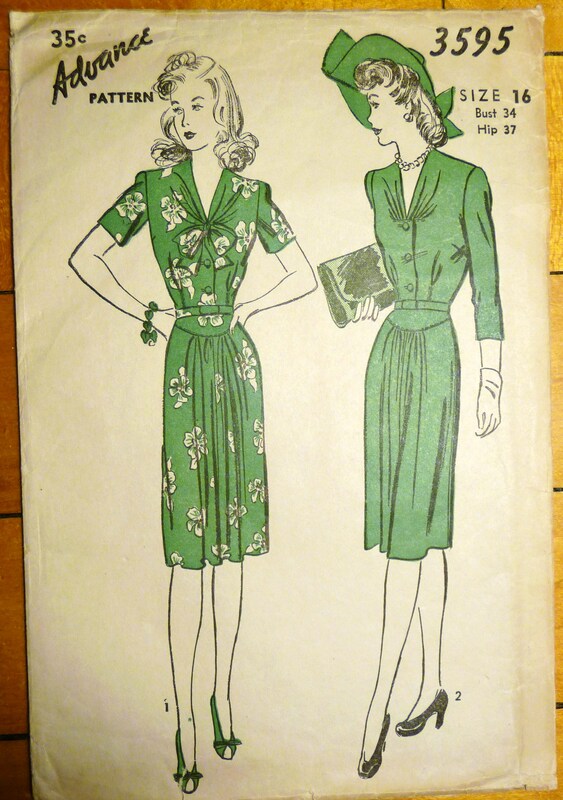 Pattern is a 1940s Advance 3971, sleeves shaped with nifty gussets; I keep meaning to get a good photo, they are so cute in themselves. Me-made mustard belt too. Because the fabric isn’t visible in the main photo, there’s the accidental misfire detail shot below left: fabric is a rayon blend navy and white textured crosshatch. 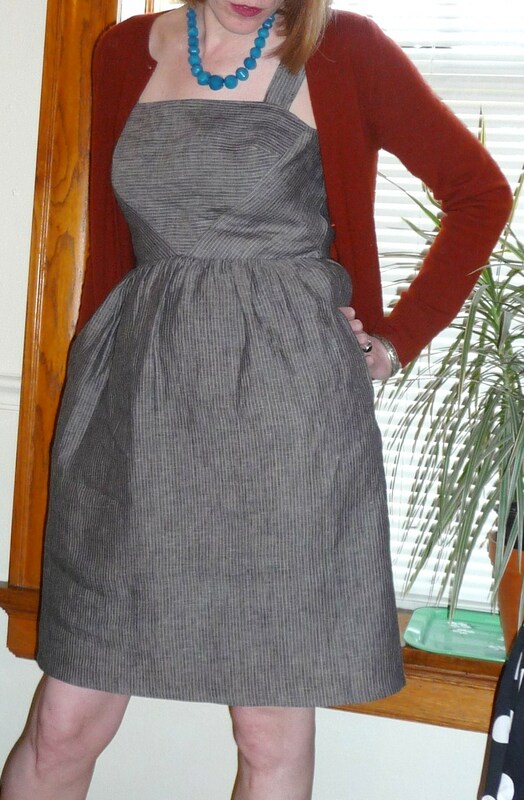 Same dress in a photo from Self-Stitched-September 2011, shown with the bow that I made removable, below right. Another Colette Rooibos in vintage cotton home dec fabric, with black piping, and cactusy green broadcloth contrast at the neckline. After breaking the zipper a couple times trying to get it over the heavy fabric plus piping (sans cording! just the heavy storebought poly piping fabric) at the midriff seams), I pieced in empty bias loops of black cotton lawn along the left side seam. There, that’s my construction secret for this the 3rd version of Rooibos I’ve made! 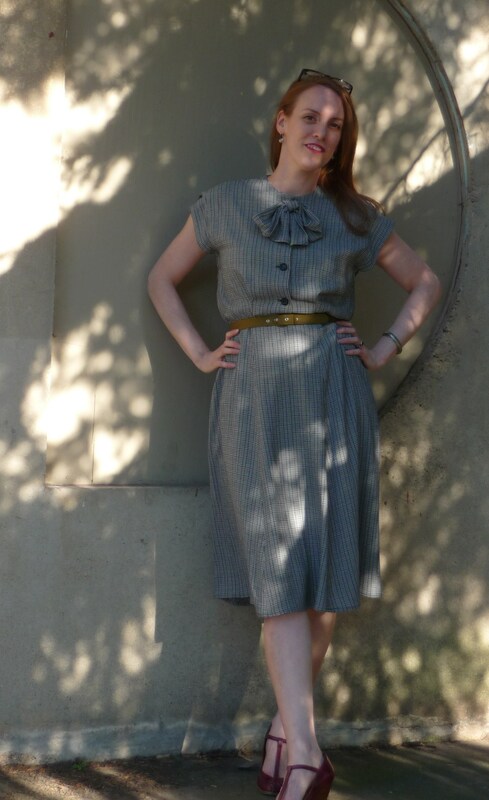 Mulberry rayon doubleknit wrap from 1930s pattern, layered over Colette Hazel sundress in pinstripe linen. This was a themed challenge day, theme being Ugly Places. Just off the NDSU agricultural campus, I was headed for a cluster of silos when I spied this instead. The graffiti appears to say Moo, which was exactly what it smelled like. And there you have it, my May so far. I’d say that the collective ante has been upped all-around, as far as I can see! Maybe it’s that we’ve all grown so much as sewists together, maybe it’s that we’ve just felt more comfortable to express ourselves with each other, maybe (probably?) it’s that we know there’s just the one time out this year. But it really seems like everyones’ talents are really just knocking me out every single day in there. Just crazy goodness!! POLL! 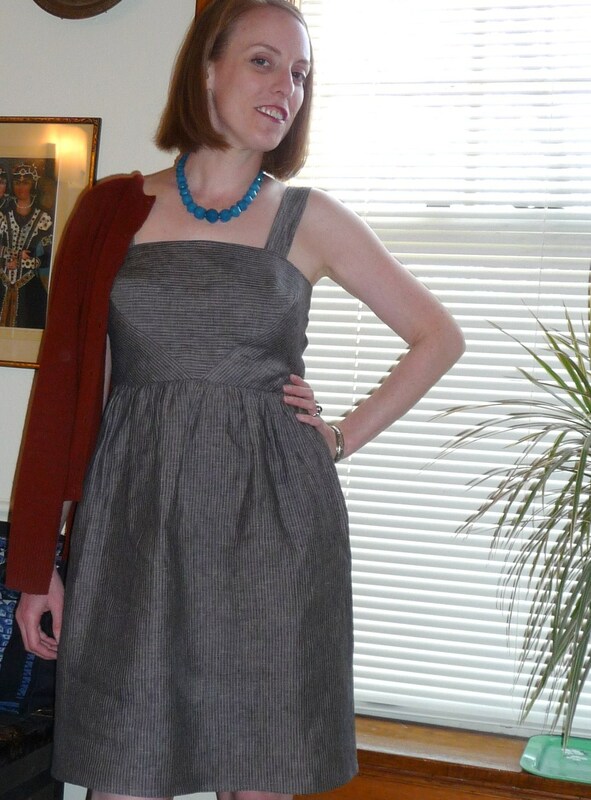 Vote on my 40s frock project for Me-Made-May! One of my goals for this year’s Me-Made-May is to complete one pattern from my A-list stash that I have yet to sew. It’s time for one of these lovelies to see the light of day, deadline: end of May! 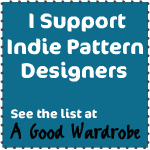 Want to help me decide which pattern I sew in time to wear for the end of the Me-Made-May challenge? 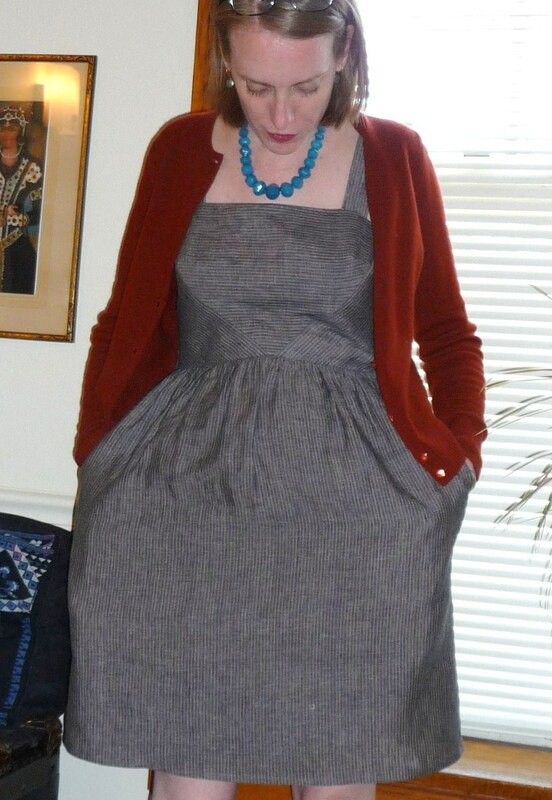 The sultry faux-wrap Butterick 3506, in view B for daytime (although I am utterly in love with the maxi A too), with the elegant sweeping curve at the overlapped hem. 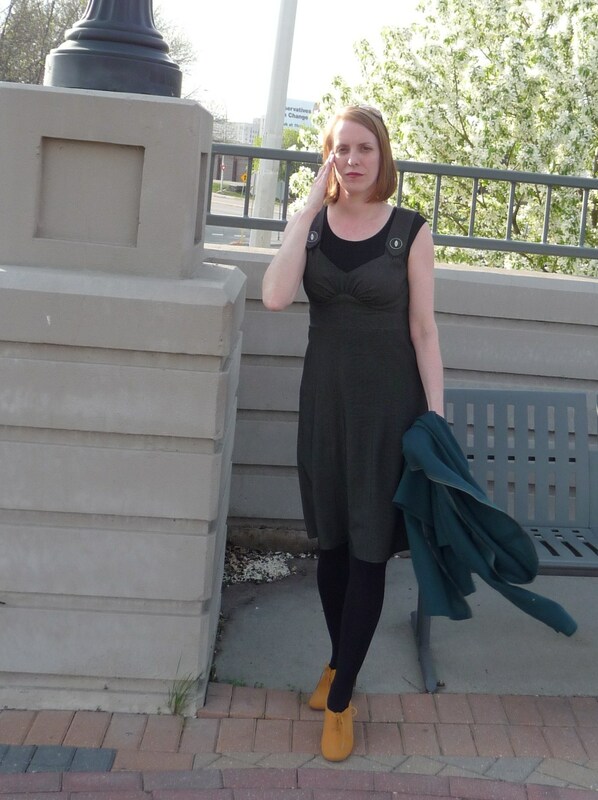 Generally wrap dresses are out for ladies with my body type, I believe that those cap sleeves- angling out giving that triangle-shaped bodice- make this *my* wrap dress! The flirty tie-neck, gathered-skirt Advance 3595 in view 1, with the perfect combination of feminine details and office-appropriateness, trim through the high waist, but flattering gathers through the abdomen create gently cascading skirt. I love this pattern! 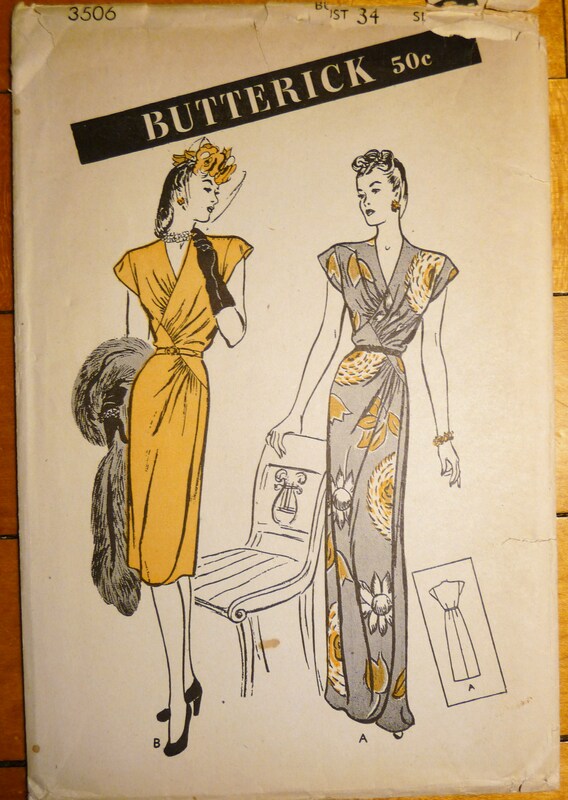 Which 1940s frock should I make for Me-Made-May? Thank you!! I’m so curious to see which one gets the vote! Next New Colette Pattern: Hazel! Here’s Hazel, the second of the two brand-new Colette Patterns sundresses that I had the pleasure of testing for their new new spring/summer line! I love this pattern; when made with striped fabric, you get this very cool radiating lines effect. It is not quite so apparent in my photographs, but check it out in the gorgeous red and white example in the above links, or Sarai’s blue and white from her South America photo montage! Such cool stripes!!! Anyway, here’s what I did for my tester version with a very lightweight pinstripe black & tan linen that I had on hand. The stripe effect is much more subtle, but you can still see it well in person. The similarities between the Lily and Hazel patterns are mostly limited to the straps, which as far as I can remember are pretty much identical. Also the waist hits in about the same place on both dresses. The back of the bodices are constructed in a similar manner, with princess seams rather than darts, and center invisible zipper. Everything else is constructed in a completely different manner. While Lily has a very traditional princess-seam construction, albeit with clever and flattering angles, flaps, and pockets, Hazel is an entirely different animal! I haven’t made anything at all like Hazel before. Her bodice consists primarily of one big triangle cut on the fold, which has darts in the sides (overall effect a bit like the Superman logo, you know, the blunted triangley shape? 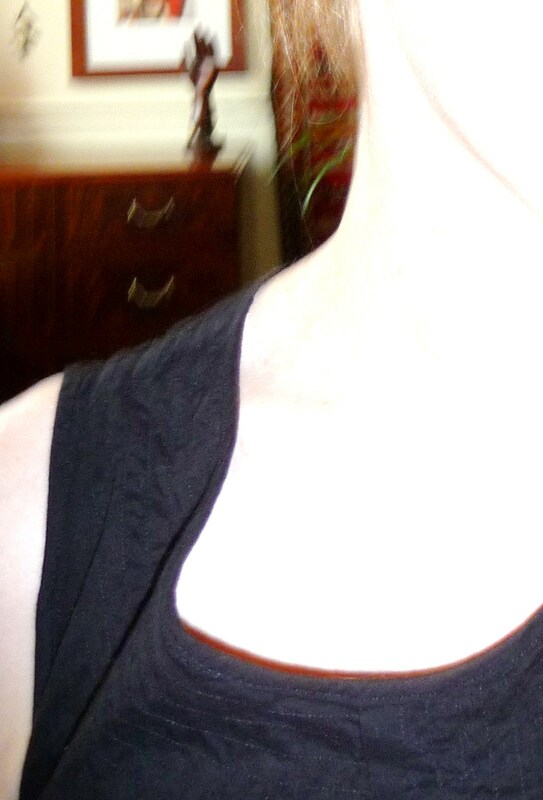 cracking myself up), flanked by bias-cut trapezoids on the sides. Sarai is going to do a tutorial on how to do FBAs/SBAs on The Triangle because it is a little unusual! (I gather there’s going to be an actual sewalong too! I’d like to give this another go with that tutorial because as you can see I didn’t quite get there myself…) The other main difference, is the skirt is much fuller. It maybe isn’t as apparent in the heavier fabrics, but with this really lightweight linen, I think you can see the difference of the fuller, gathered dirndl skirt, versus the pencil skirt on the Lily. Pockets on Hazel are hidden in the side seams, in the fullness of the skirt. The pattern recommended using three rows of gathering stitches to get good control on gathering the skirt. I’d never actually done that before, although I remember that popping up either on the Coletterie blog or in their email tips, Snippets, I can’t remember which. Wow, I’m a believer now- I don’t want to gather any other way! See the optical illusion there? Eye thinks there is a nippy-in waist thing happening there! Rock on Colette Patterns! Sarai is so clever with these things! p.s. My grandmother‘s name was Hazel. I am a little goofy sentimental about that name! Of course I’ll be MMMing; you? So Zo… What Do You Know?